One thing is for sure; there is no shortage of delicious tomatoes and cucumbers in the summer. My garden is fully loaded with these summer time veggies and I take full advantage of them throughout the season. Whether or not you get these abundant veggies from your own garden, local farmers market or grocery store, I hope you too are enjoying these scrumptious beauties! This chunky pearl tomato and cucumber salad is the perfect summer accompaniment to many grilled meats. Serve alongside grilled chicken, steak, fish or pork or enjoy all on its own! Whisk together olive oil, lemon juice, lemon zest, salt and pepper in a small bowl. Set aside. 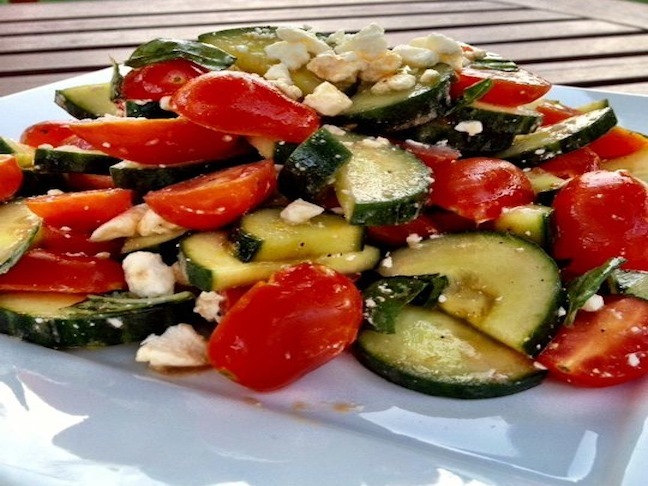 In a large bowl, add sliced tomatoes, cucumbers and feta cheese. Top with lemon vinaigrette dressing and toss salad to coat all of the vegetables. Serve as a side to grilled chicken breast, steak or pork. Wine Tip: Serve alongside a crisp Sauvignon Blanc! Try Dry Creek Vineyards Sauvignon Blanc.